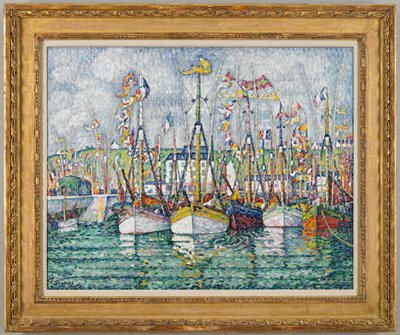 The sailboats in this painting weren’t made to race. They were designed to catch fish. But seeing them all lined up by the dock may bring to mind the scenes now unfolding at the Summer Olympics. 470s racing in Weymouth at the London 2012 Olympic Games.